Review: If the internet is any indication, most Arcade Fire fans prefer their first album, Funeral, and while it's admittedly a close call for me, I have to go with Neon Bible myself. It has a much grander, more epic scope than their first album, it was recorded in an old church and has a sort of hollow, echoey sound that I quite enjoy. If people say that the first album was Bowie influenced, then this one definitely has a bit of Springsteen in its inspiration, and his touch can particularly be felt on the track "(Antichrist Television Blues)". Much of the album has a bit of an early 80s New Wave sort of feel to it, but featuring a wide variety of instruments, such as pipe organs, accordians, mandolins, hurdy gurdies, stringed instruments, and my personal favorite, haunting female vocals that faintly sort of trace the edges in the background. As the title suggests, religion is one of the major recurring themes of the album, especially present on my two favorite tracks, "Intervention" and "(Antichrist Television Blues)". There are plenty of other poppy, catchy-as-hell tunes here as well, most notably "Keep the Car Running" and a newer, better version of "No Cars Go", originally recorded for their self-titled debut EP. My absolute favorite track on the album is without a doubt "Intervention", a song I have played for some friends who were completely unmoved and indifferent, but to my ear it's one of the prettiest songs I've ever heard, with it's grandiose pipe organ, chimes and ethereal female vocals floating in the background. It makes me think of cold December nights when everything's all lit up with stringed lights but there's also that sort of wintery melancholy in the air as the year is nearing its end. My favorite Arcade Fire songs tend to be the ones that feature Régine Chassagne on vocals in some capacity, either doing lead (such as Funeral's "In the Backseat") or just enhancing the background with her vocal melodies. My absolute favorite moment on this album comes about three and a half minutes into "(Antichrist Television Blues)" where a wall of female voices just blows up and then sound as if they're soaring and spiraling around each other. I don't know if it's just her with different vocal tracks layered in, if there are multiple singers, or even if they used samples, but that one unique 20-second stretch absolutely defines the phrase "ear candy" for me. If you tend to notice and appreciate these little background touches that enhance but don't exactly drive the song, and you like that spacey, distant sound that makes the band sound like they're playing in a large, dark cathedral, you will probably dig this album. If you're an Arcade Fire fan already but didn't care much for this album, pull it out again and have another listen. It's no Funeral, sure, but I just hope that means that the Arcade Fire will be with us for a long time to come. Great review. There is definitely a haunting, surreal and original sound that emanates from this album. It took a few listens for me to get into, but once I did, it quickly became of a staple of late night car rides on my way home from work. The wind-chime like vocals that jump in during "(Antichrist Television Blues)" are definitely one of my favorite moments in the album as well. Another favorite part of mine is the wall of sound that crashes in, breaking the mellowness of "My Body is A Cage". I could go on forever (like a huge nerd) about how much I love this album but I should stop for the sake of self-respect. Hell yeah, finally a review of a Arcade Fire, although I have to agree with the very first statement you make Proto. I like Funeral a lot more. I should come as a n interesting note, however, that I am relatively new to Arcade Fire and that I should listen their material more carefully, maybe I can change my mind later. By the way... Any chance you review Gallowsbird's Bark from The Fiery Furnaces soon? I fell in love with Arcade Fire by discovering their song "Cold Wind" on the "Six Feet Under" Soundtrack and then proceeded to buy up every thing else available. 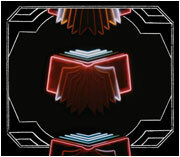 I think Neon Bible is a better album then Funeral and only because to me it has a much more darker and hopeless scope, which all in all is kind of deceitful seeing as how an album titled "Funeral" should be filled with morose and dark tracks and most are beautiful arrangements of up tempo beats, while "Neon Bible" sounds like it could be a Killers record and is far better and much darker than anything the Killers could ever hope to create. Thanks for this review Proto, Until finding the Arcade Fire I never though a single band could come close ot my loveof Nine Inch Nails... I was wrong. God I love this album, need to go home and listen to it pronto. The American special edition is different to the one the Europeans got, I think. I got it, and it comes with a bunch of flipbooks and stuff, hahaha. I usually think of the word "grandiose" in terms of negative connotations, but whatever does it for you.